Enif, meaning nose in Arabic, is a yellow and blue star on the nose of the Winged Horse, constellation Pegasus. 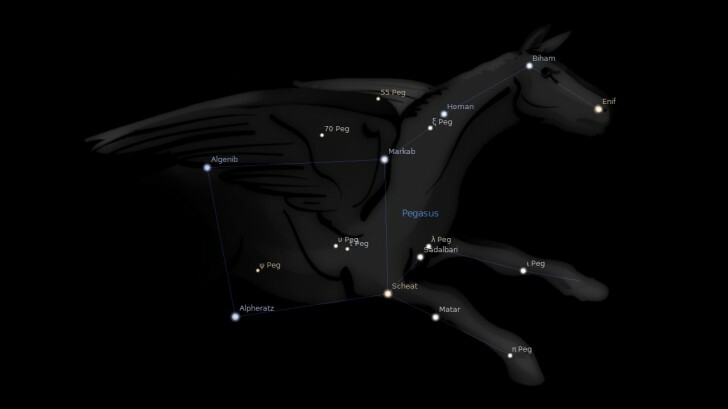 The brightest a (on the neck of the horse at the junction of the wing), comes down to us with the ancient Hebrew name of Markab, which means returning from afar. The star b (in the near shoulder) is called Scheat, i.e., who goeth and returneth The star g (at the tip of the wing) bears an Arabic name–Al Genib, who carries. The star e (in the nostril) is called Enif (Arabic), the water The star h (in the near leg) is called Matar (Arabic), who causes to flow. 1. Star Names: Their Lore and Meaning, Richard H. Allen, 1889, p.321-322. 2. Fixed Stars and constellations in Astrology, Vivian E. Robson, 1923, p.56, 205, 206. 4. Manilius, Astronomica, 1st century AD, book 5, p.350-353. 5. The Living Stars, Dr Eric Morse, p.127. 7. Planets in Transit, Robert Hand, 2001, p.30.